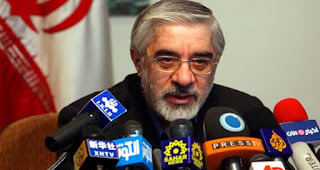 Mir-Hossein Mousavi, the leader of Iran's opposition green movement was involved in the massacre of more than 10,000 political prisoners in 1988, according to a report. Mr Mousavi, the defeated candidate in last June's presidential election, served as Iran's prime minister when Ayatollah Ruhollah Khomeini, the regime's spiritual leader, issued a fatwa that sentenced thousands of political prisoners to death without trial, according to the report by one of Britain's leading human rights lawyers. Mr Mousavi is one of several prominent Iranian politicians who are accused of implementing the order. According to a detailed report published by Geoffrey Robertson QC, who specialises in human rights law, the prisoners were executed for refusing to recant their political and religious beliefs. "They were hung from cranes, four at a time, or in groups of six from ropes hanging from the stage of the prison assembly hall," the report states. "Their bodies were doused with disinfectant, packed in refrigerated trucks, and buried by night in mass graves." Mr Robertson compares the mass executions in Iran with the 1995 Srebrenica massacre during the Bosnian civil war, in which an estimated 8,000 people died. Con Coughlin's story at the Telegraph, continues here.